Life has been a bit extra busy in the last week or two and I haven't had time to blog much. So, tomorrow I'm taking a small break and heading to Savannah, GA for a few days. I've almost finished packing, including a new sock project. 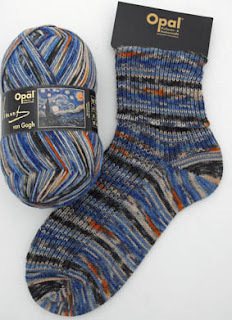 This time I'll be knitting with Opal Van Gogh sock yarn in the "Starry Night" colorway. If you look on the label you can a little picture of Van Gogh's Starry Night painting and how well the yarn matches the colors he used. Normally I would knit back and forth, first one sock and then the other: leg/leg, heel/heel, foot/foot, toe/toe, but not this time. I'm too lazy to split out the ball of yarn so I'll just do one complete sock and then the other.